Five years in the making, Oliva Cigar Co. delivered their family’s finest achievement in premium cigar craftsmanship in 2012, subsequently sending the collective cigar world into a frenzy of adoration. This included consistently high rankings (94 to 96 points from most reviewers) and even the prestigious award of Cigar Aficionado’s No. 1 Cigar of the Year in 2014! 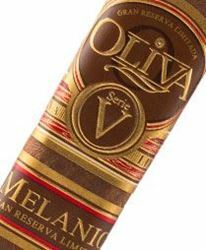 The cigars follow Oliva’s popular strategy of a clean and clearcut tiered structure, presenting the Oliva Serie G, Serie O, and Serie V cigars that escalate the consumer gradually to their most premium offering—Oliva Serie V Melanio. The cigars are named for Oliva family patriarch Melanio Oliva, whom became the first Oliva to enter the tobacco industry when he began growing tobacco in Cuban during the late 1800s. Honoring the family’s rich history in the cigar industry, Oliva Serie V Melanio showcases the Oliva’s finest, well-aged tobaccos in their possession. This consists of a Nicaraguan-centered blend, highlighting tobaccos of Nicaragua’s Jalapa region, which is known for its refined and nuanced characteristics (compared to the more fiery tendencies of the popular Estelí region). The cigar’s all-Nicaraguan interior is finished with a rich, rust-hued Ecuadorian Sumatra leaf. This combination allows Melanio to deliver a refined experience that is astonishingly full-bodied, offering notes of coffee, leather, and even a unique note of creamy tomato soup, all brought to balance with a medium/full strength that makes for an unmistakably luxurious smoking experience.